In celebration of Earth Day’s 40th Anniversary, National Geographic Channel is excited to announce its very first NatGeo Earth Day Run on April 18, 2010 at the SM Mall of Asia. This fun run is open to all interested runners who are willing to participate in the 3k, 5k and 10k races. Race will start at 5:30 am. Proceeds will go to the Design Against the Elements (DAtE) art competition project to rebuild climate resilient communities designed for a greener environment. DAtE is a project of MyShelter Foundation. You can also check out the details about the art competition. Through this event, NatGeo aims to promote Earth Day and its global mission to inspire people to care about the planet. Help save the environment. 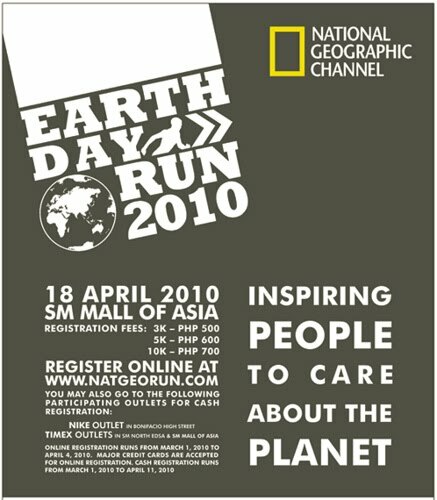 Join the NatGeo Earth Day Run!